Many thanks to Hugh Rose, at Trian House, for sending these shots of farms in Glen Artney, a McGruder homeland from the mid 16th c. until the early 19th c. Glen Artney lies on the geological fault line that crosses Scotland from SW to NE, marking the boundary between Highlands and Lowlands. Since most of us will visit in summer, it’s especially nice to see this autumn colors. While you celebrate its beauty and give thanks that it hasn’t fallen prey to modern development, keep in mind that before the Clearances Glen Artney was a thriving community, far larger than it is today. By the late 18th c. it was home to as many as 2,000 people–farmers, weavers, mill workers, shepherds, woodsmen, and artisans. 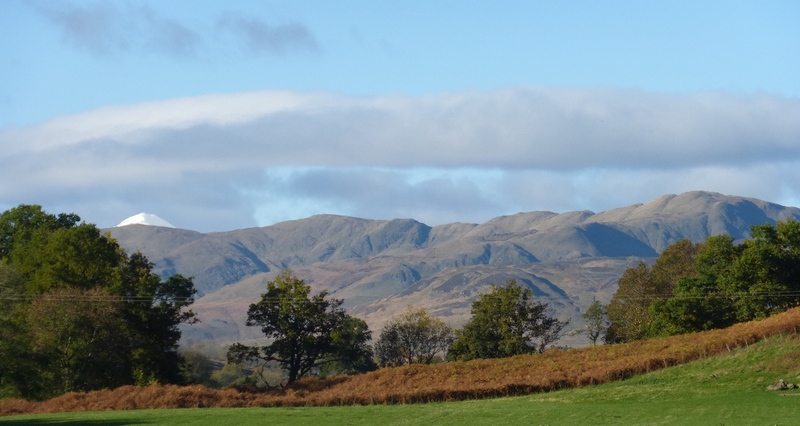 Glenartney in November, looking NW toward snow-capped Ben Vorlich. Photo by Hugh Rose, 2013. Craigneich/Craigneish, looking NW toward snowy Ben Vorlich. Photo by Hugh Rose, 2013. 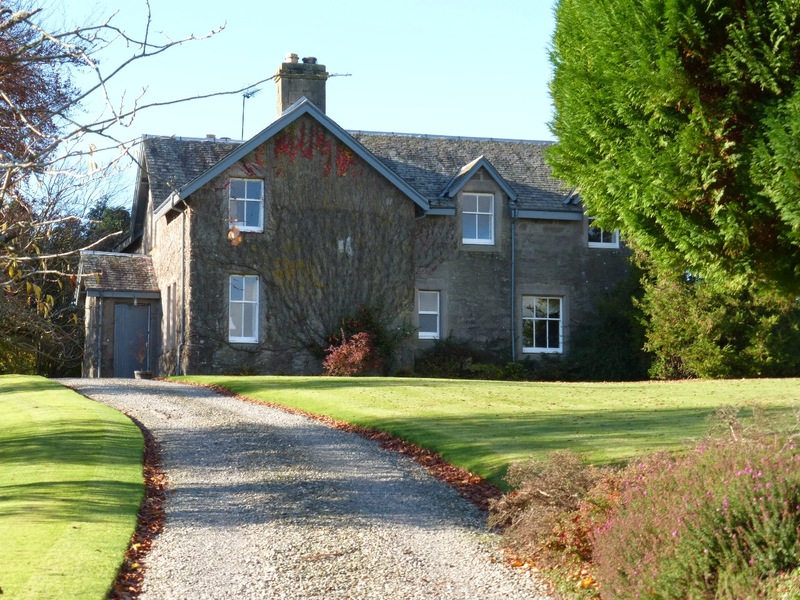 MacGrouthers/McGruders held the lease of Craigneich until the end of the 18th c. Alexander the Immigrant’s father was born there, and we believe that Alexander was raised there after his father died and his mother remarried. He named one of his Maryland plantations Craigneich, which was quickly Anglicized into Craignight. Here’s a close-up of the current farm house. 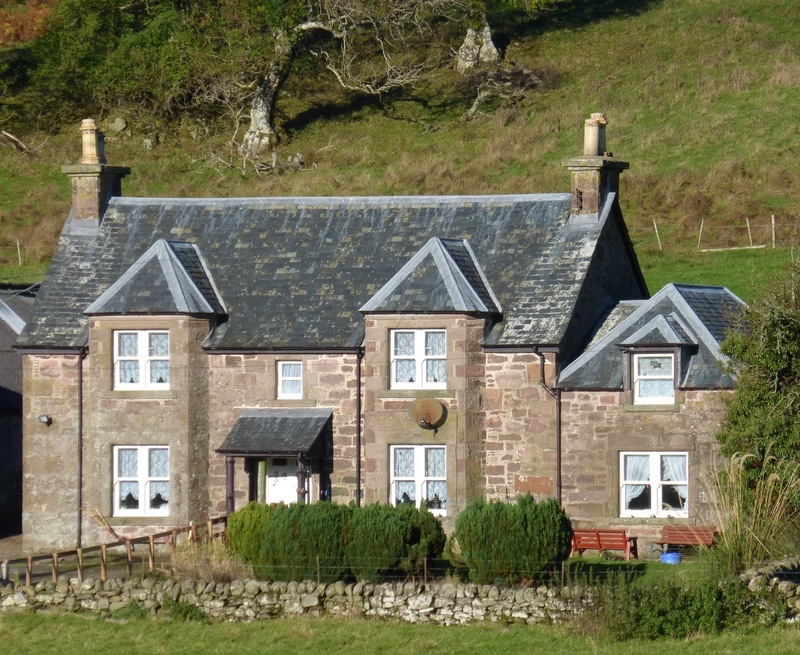 House at Craigneish. Photo by Hugh Rose, 2013. Farther up the glen lie several farms at Meigor/Meiggar, where John McGruder (Alexander the Immigrant’s uncle) acquired land in 1630, making the rare transition from tenant to landowner. In the records, he changes from John MacGrouther IN Meigor to John MacGrouther OF Meigor. His descendants owned land and houses here, and part of a mill, until the early 19th c. After the 1745 Jacobite uprising, they fought hard to retain their land, including extensive leases they held from the Drummonds. Drummond estates had been forfeited following the rebellion, so the MacGrouthers and other tenants found themselves dealing with new owners, new estate factors, and new laws. Traveling up the glen, the first site is Easter Meigor/Meiggar. Easter Meiggar. Photo by Hugh Rose, 2013. Next comes Trian, or Treyanmanich (Treyanmianuach), also known as the Middle Third lands of Meigor. 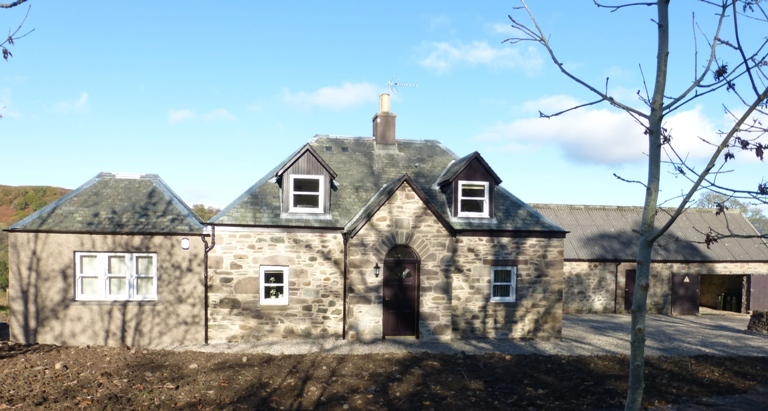 The house now called Trian Cottage is on the original home site. Trian Cottage. Photo by Hugh Rose, 2013. Hugh notes that though the house has been added onto on both sides, and the conservatory added at the front door, you can still see the two-up, two-down construction of the original house. Here’s an aerial shot. 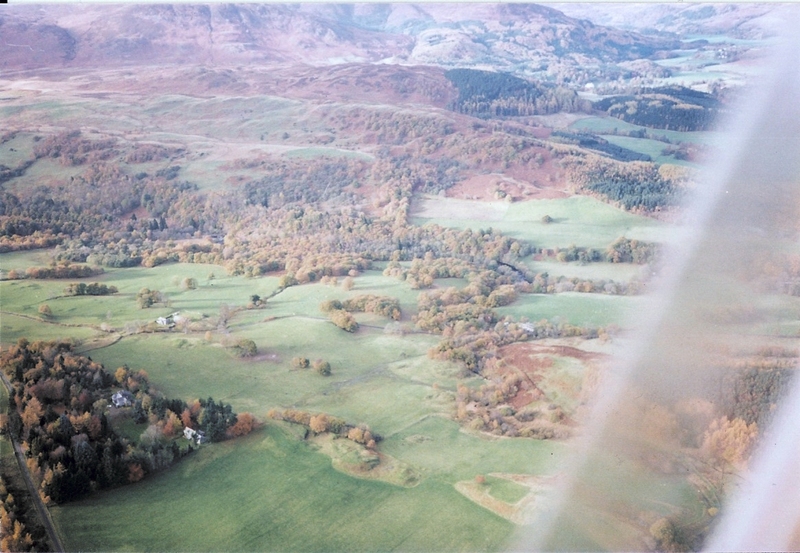 Trian Cottage from the air. Photo by Bob Fryer. Close by Trian Cottage stands the modern house at Trian, built in 1924. Trian House from Milntuim. Photo by Bob Fryer. The house at Lower Meiggar. Photo by Hugh Rose, 2013. Beyond the trees in the photo of Trian lies Lower Meiggar. This shot shows the house with its additions and garage. The next shot shows just the original house, rebuilt in 1815. Lower Meiggar, the 1815 house. Photo by Hugh Rose, 2013. 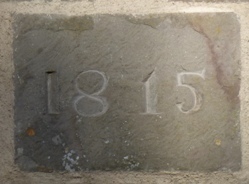 Lower Meiggar date stone. Photo by Hugh Rose. Wester Meiggar, the last of the four farms, lies to the far right in this aerials, that also show how the farms lie in relation to each other. Trian, Trian Cottage, Lower Meigor & Wester Meigor. Photo by Bob Fryer, November 1989. If I’m understanding the photo correctly, this aerial was shot from the southeast. Trian House & Trian Cottage are in the foreground, nestled into the woods; Lower Meigor/Meiggar lies just beyond them, partly obscured by the trees; Wester Meigor/Meiggar is by itself off to the left. And here is a close-up of Wester Meigor. Wester Meigor in winter. Photo by Hugh Rose, 2015. Trian, Trian Cottage, Lower Meigor & Milntuim. Photo by Bob Fryer, November 1989. This one shows Trian House & Trian Cottage at the lower left, Lower Meigor just above that, and Milntuim House at center right. The view is looking northeast. These aerial shots were taken by Bob Fryer from a helicopter. Trian, Milntuim, & Easter Meigor, from Dunira. Photo by Hugh Rose. 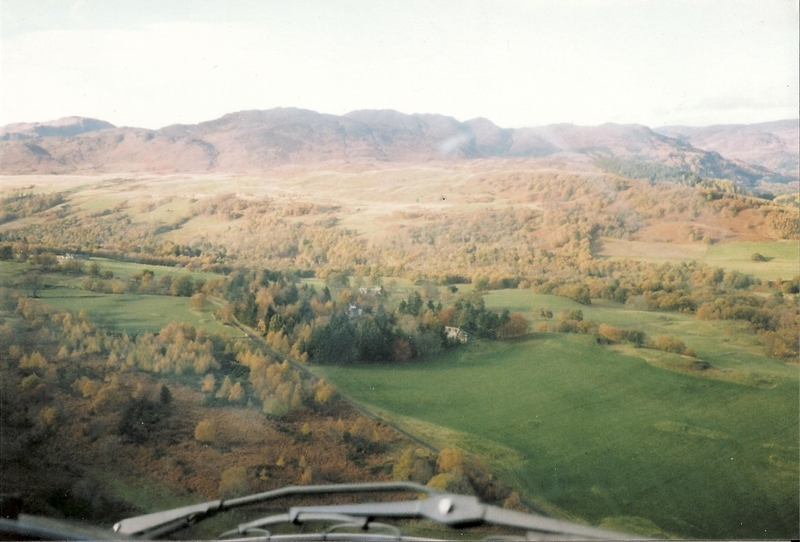 The Dunira estate is northwest of Comrie, and the Meigor area is southwest of Comrie; so this shot looks south/southeast from Dunira. The prominent white house in the middle distance is Trian House. 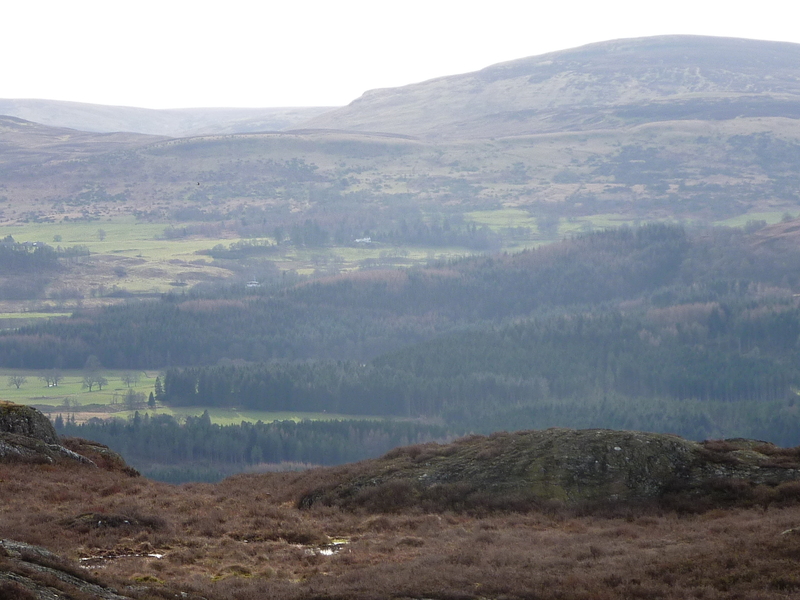 Just lower and to its right, rather faint, is (I think) Milntuim House, while Easter Meigor lies at the far left edge of the photo. At Milntuim were several mills, including a lint mill and a corn mill that employed residents of the glen and served their needs. Beautiful photos! Almost makes me homesick in an ancestral way. When (if) it ever stops raining, I will climb the hill and take a picture of Wester Meiggar from above! Happy New Year from soggy Glenartney! And a happy New Year to you, too, Hugh…from icy northern Virginia, which can never decide if it’s southern or northern, so it settles for the worst of each: southern summers and northern winters. 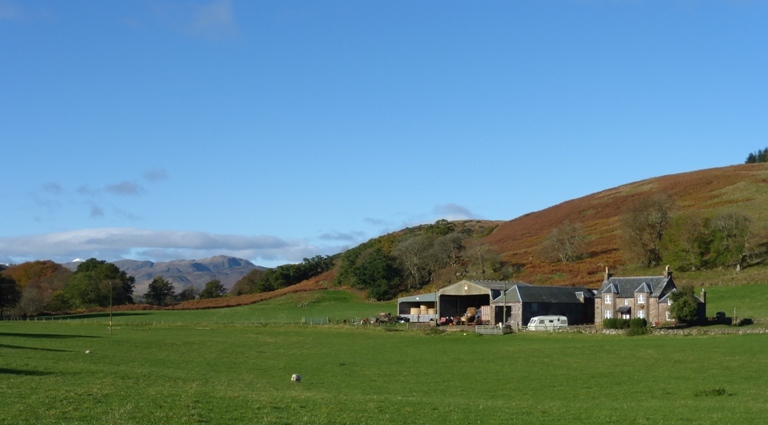 I found (and enjoyed) your article on searching for Craigneich Farm. An ancestor of mine Hugh McIntyre was born 1808 at Blairinroar which I assume to be at the farm, his father being a farmer. First chance I get I’ll visit the area, in the meantime your article and photos give me the flavour of the Glen. Thank you. Blairinroar (which I believe may mean ‘Place of a Bloody Battle’) is the area around a crossroads one mile to the East of Meiggar. 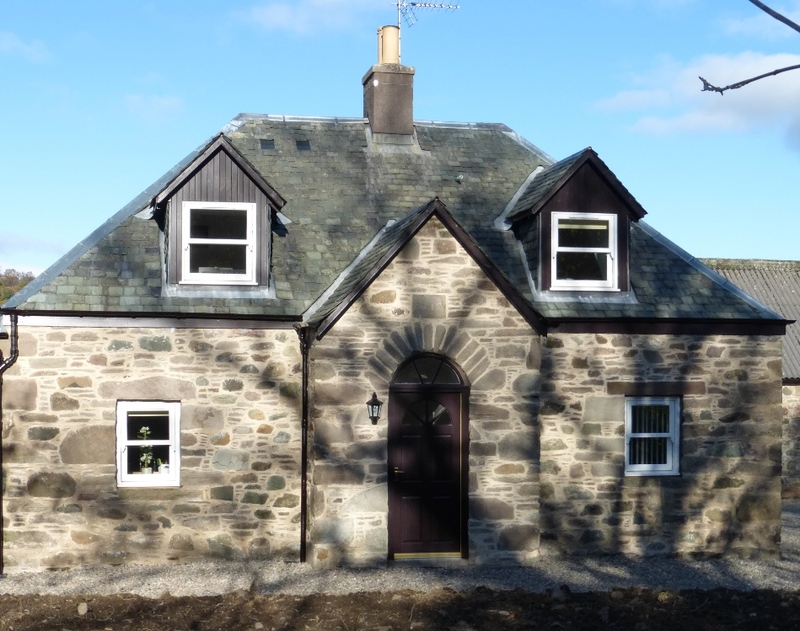 There are two cottages there and an old farm which has now been renovated into a private house called Coilcambus. There are other farms in the area Middleton and Culloch and the old School House but I would think that dates from a bit later than 1808! While you were typing this, I was typing a blog post inviting readers to do just that! It remained in his estate until 1960 when he retired. My sister and I lived at Trian during the war years – it was a paradise for the two of us, full of wildlife, bird song, the occasional straying deer and beautifully kept grounds. Our favourite area was the woodland on the west of the property through which ran a small stream, running down to Ruchill Water, no doubt. 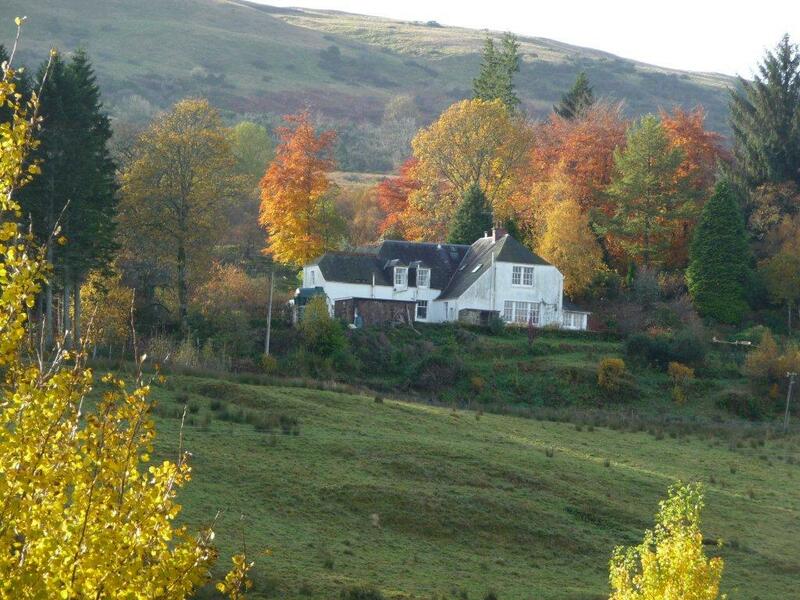 (Mclaren / Monteath ) grandmother’s wish to have a place in Scotland close to her clan lands. She never lived anywhere else. To study these (heretofore unseen) photos of the place is very gratifying – even though only the rear of Trian House was featured ! On the far right of the house – at ground level – is a small white projection. This was the loggia ( a sort of closed-in veranda ) which was our playroom on wet and snowy days. The postman delivered twice a day, cycling up from Comrie to do so. Unbelieveable ! Thanks for sharing your memories, Christian. I hope to post new photos later this year. So kind of you to reply. Look forward to seeing more photos eventually – Glen Artney is very close to my heart. I have read somewhere that the Gaelic name Glen Artney means ‘glen of pebbles’ . 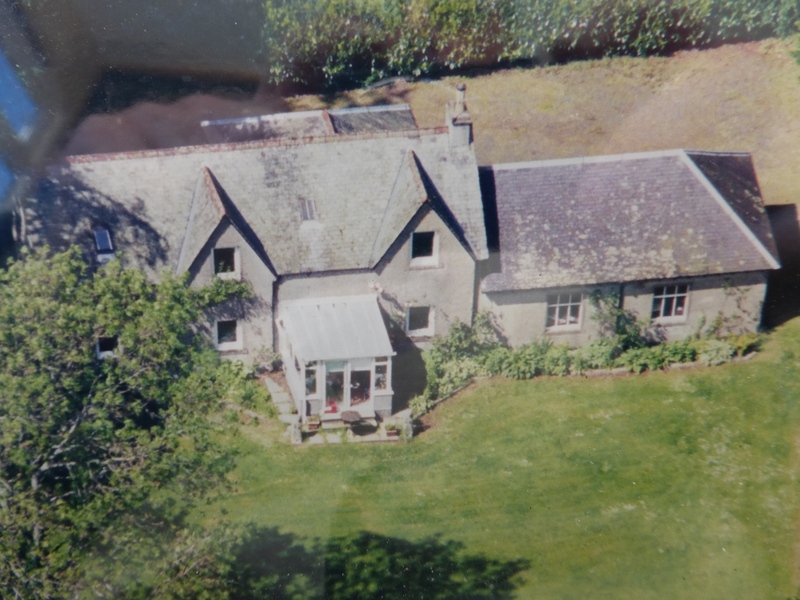 I am the current lucky owner of Trian House having inherited it from my parents – I will send Susan a photo of the front of the house too or she can take one when she visits! I have a copy of the feu deed by which Lord Ancaster (my mother’s uncle) transferred the property to your grandfather. Our family story is that your grandfather always used to rent Trian Cottage as a holiday home and when Lord Ancaster (in gratitude to your grandfather for saving his eyesight) asked if there was anything else he could do for him, your grandfather asked for a feu on Trian so he could build a house – Lord A could hardly refuse! The burn (stream) which you remember was the Western boundary to the property. We have the right to generate hydro electricity from it but there is not enough water! Our predecessor as owner (Colonel George Rusk) rented the other bank of the burn from the Estate to make fencing easier. For years we paid annual rent of a few shillings for this small strip of ground but eventually bought the freehold. 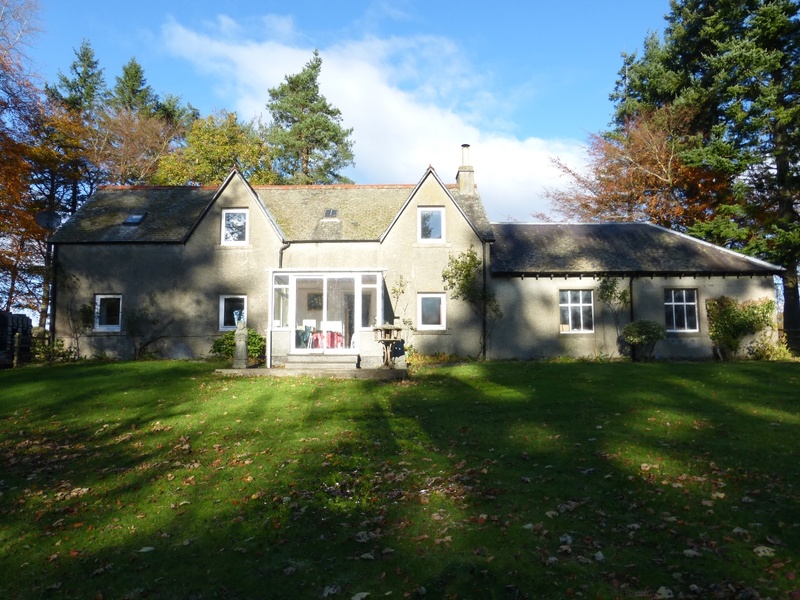 We also have sale documents including a valuation of the field below (to the north) of the house but sadly it does not appear that the sale was ever completed because the Estate still farms it. The loggia you mention was apparently originally an open veranda against the side of the house with a door leading into the dining room where your grandfather used to see local patients. Those waiting for their appointments, sat on benches on the veranda but they complained of the cold so he closed it in and eventually made an opening in the wall and included it as an extension to the sitting room (what used to be called the games room). I am so grateful for all this information and beautiful photos! Thank you. I am a descendent of Alexander Magruder and I just loved seeing this. Do you (or anybody else) know what Craigneich means? I presume Craig means rock, but what does neich mean? Someone said it meant horse hoof. Does this sound right to you? Hi Holly. Glad you are enjoying the site. You should also check out Liz O’Hara’s great photos and travel journal from the McGruder country, linked in one of my blog posts. Just search for “O’Hara” and it will turn up. I have read that Craigneich means “rock of the raven,” but have never found any confirmation of that. The online Dictionary of the Scots Language gives “neich” as a variant of nech, a verb: to draw near or to draw near to. There is a standing stone on the farm (age and origin uncertain, as far as I can tell) so it’s possible Craigneich means something like “gathering stone.” But I’m winging it here. Maybe a Scottish reader will see this and set us all straight. Think I’ll turn this into a blog post and see what happens. Ohhhh! I hope it means Gathering Stone. I like the sound of that. Thank you so much for replying to me. Yes! I have seen Liz O’Hara’s wonderful photos and travel journal. I love them. I actually went on Google Street View and “rode” all over the roads “sightseeing”. I found the Craigneich standing stone and could see it very well, actually, along with the farmhouse. I enjoyed just getting a feel for the surrounding countryside and the views our ancestors had. It was so fun. One day, maybe, I just might get there in person, and stand and breathe the air and touch the stone. I hope so.